I wonder if Toshiba realize that their newest DVD-RAM/R recorder (RDX-1) is named after the prime ingredient in the military grade explosive C4, Cyclotrimethylenetrinitramine? The DVD-RAM/R recorder also comes packing a 80GB HDD for on the spot video recording a la Tivo like technology. It is now possible to record an astounding 75 hours of "The Weakest link" before having to break out the old VHS tapes for the almost laughable Survivor III. Each DVD-RAM disc holds 4.7GB worth of data. That equates to 35 hours of completely digital recording under the SP setting. per disc. Ahhh... Playback is of course best on component output, but then again you need to have a television capable to taking advantage of this new and emerging standard. Casio always seem to be sticking something on your wrist that doesn't belong there... first it was the digital wrist watch, then it was those super-nerdy calculators, then came heart monitors, GPS, altimeters, MP3 players, cellular phones and now we have digital cameras. 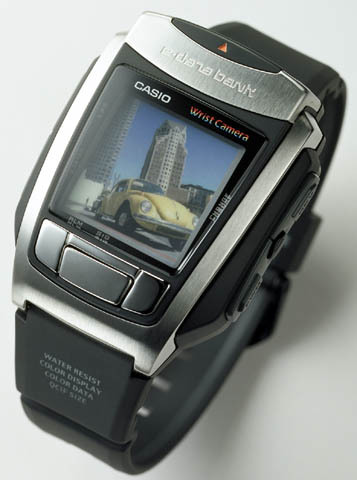 The WQV-10 watch features a digital camera which can take snapshots in the full-color at thumbnail sized resolution of 176×144 pixels. It weights a heafty 106 grams with the metal band, and just 47g with the one shown below. Somehow I'm guessing batteries are not included. Info. 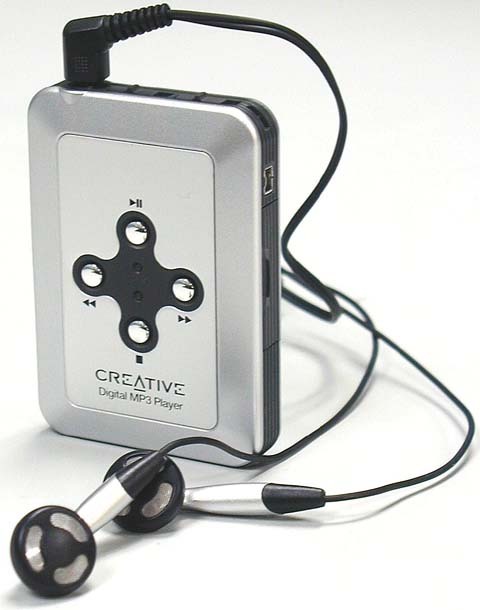 This sparse looking Creative MP3 Player is light on the memory with only 32MB built in. It will accept a 64MB MMC card to expand that up a bit, but given the number of hard drive based players on the market it might be past it's prime. This sleek, albeit display lacking MP3 player connects to any standard computer via a USB cable for transfer of songs at about 2.5mbps. Battery life has been clocked in at 10 hours, which is very fine indeed. 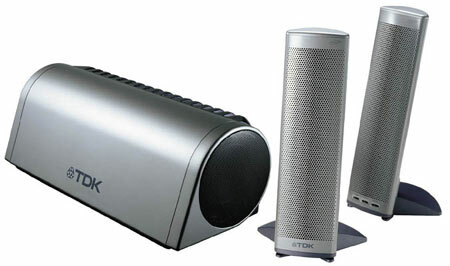 TDK are selling this amplifier as 2.1ch speaker system with sub woofer and twin flat panel speakers. New transducer adopted for the flat panel speaker use the NXT SurfaceSound technology. Good for computer speakers, not good for symphonic sounds. The satellite speakers measure 72×28×255mm and weight approximately 190g. Frequency response is listed as 250Hz to 20kHz. The sub woofer and the satellite speaker have independent controls and the the woofers uses 2 neodymium based 10cm drivers.